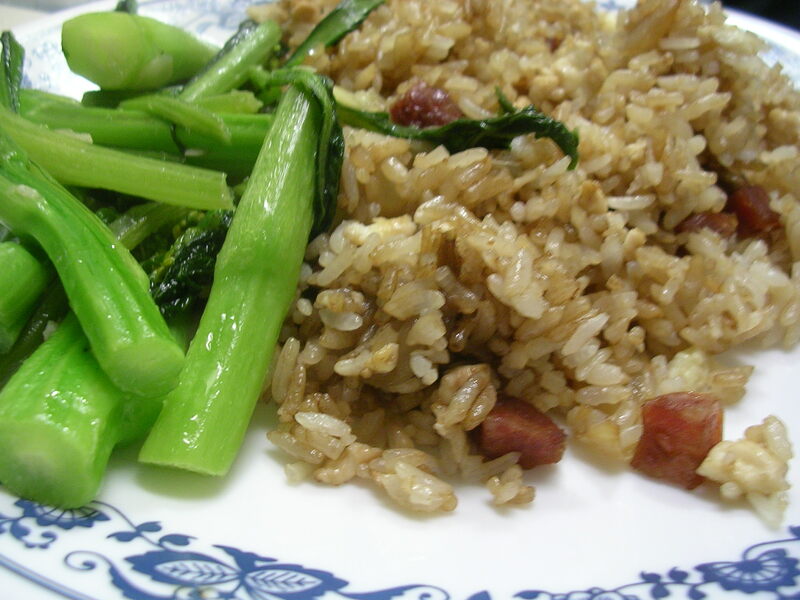 I made a quick and easy fried rice for dinner to use up our Chinese sausage, egg, and onions. We were short on veggies that day, with only a bag of yu choy (ha ha, if you get the joke), so we made that as a side vegetable dish. Yu choy is very similar to Chinese broccoli, and according to Wikipedia… it's proper name is rapeseed. Hmm not such an appealing name. But apparently this is the stuff they make canola oil from. I guess you learn something new every day. Eggs in a basket is an English breakfast dish (cooking the egg inside a piece of bread), and apparently interest in this dish revived when it was featured in V for Vendetta. So I made this for the first time in my life, and it was surprisingly easy. Briefly, you butter one side of a piece of bread, and cut out a round hole in the middle. In a skillet, you put the bread pieces butter side down, cooking the hole piece on the side as well. 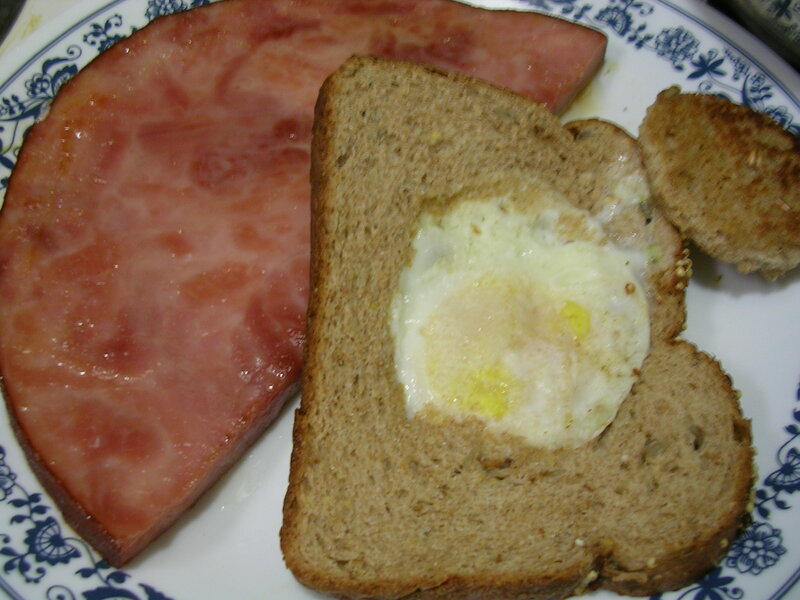 Drop a little bit of butter in the hole, and when it melts, crack an egg into the hole to let it cook. Finally, when it is nearly done, flip the bread over with a spatula and cook for just a few seconds before taking it out of the pan. Sprinkle with salt and pepper as desired. Yum. For the ham steak, it was already pre-cooked (bought from Costo), and I heated it up in a pan with a honey glaze to get some sweetness with the salty ham flavor. Quite good I must say. 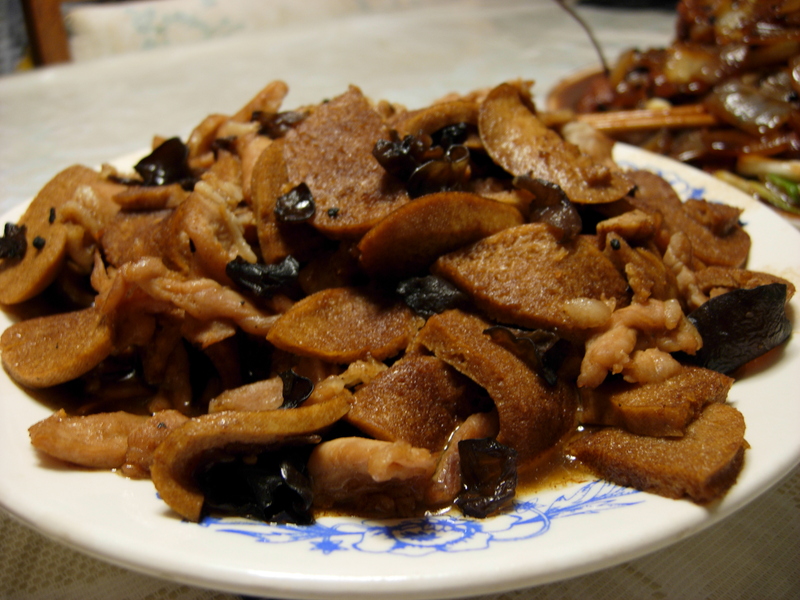 Two items in this dish that are not commonly seen: mock chicken and woodear (black) fungus. Mock chicken is usually made from bean curd, which has a soft meat-like texture and is perfect for vegans because it absorbs sauces and flavors very well, unlike tofu. Black woodear fungus is a soft fungus that grows on the bark of trees, therefore the name "wood ear". 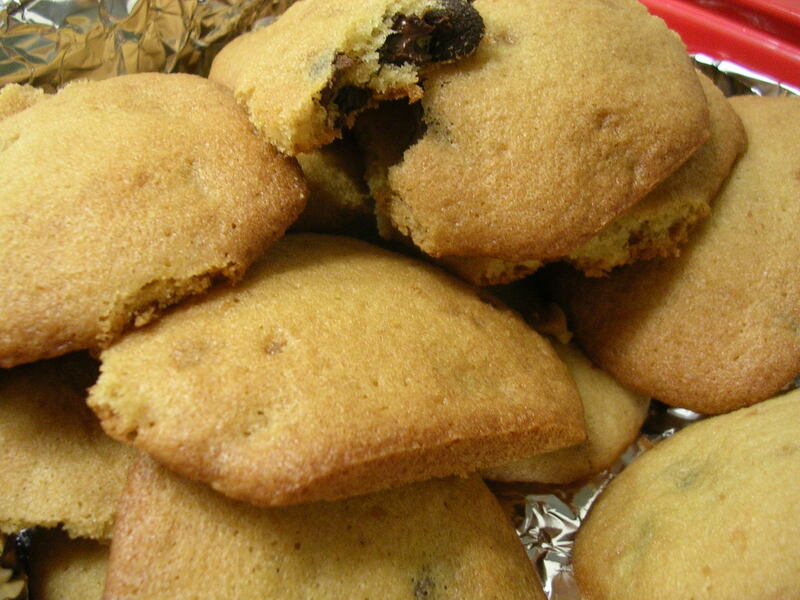 When cooked it is very thin, with a slightly crunchy and chewy texture, mild in flavor. It works best as a decoration for the dish (how often do you see black ingredients?) and for the unique texture. White fungus is often seen in Chinese desserts, and has a very similar texture to black fungus, although the taste is more fruity, therefore its use in dessert soups. Okay, I don't care how much you love your local Chinese restaurant's sweet and sour fare, because it's fake. If it's orange or red, it's just plain not authentic Chinese sweet and sour. 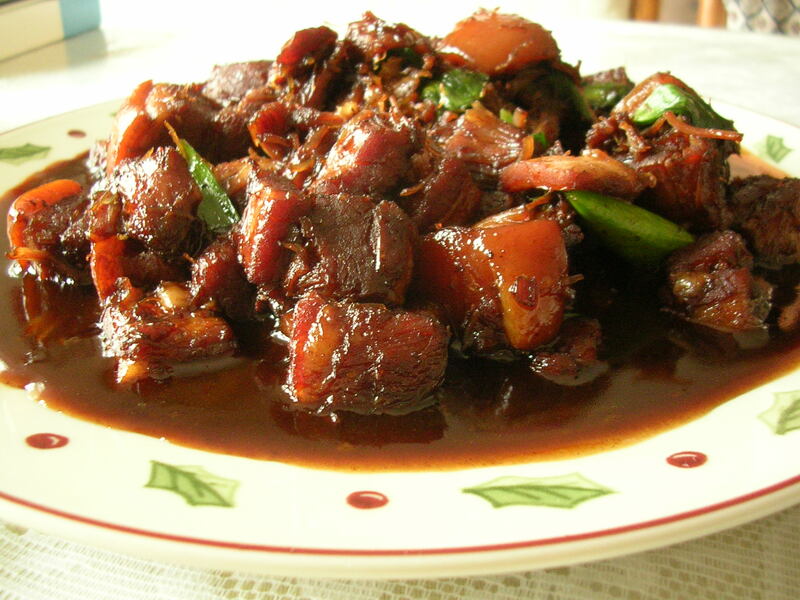 Real sweet and sour, which is actually very popular in China, is made with black vinegar and soy sauce and sugar, which is why its color is a dark brown, similar to red braise. Its flavor is much less sweet than Americanized Chinese sweet and sour, in fact it is dominated by the sour of the vinegar. 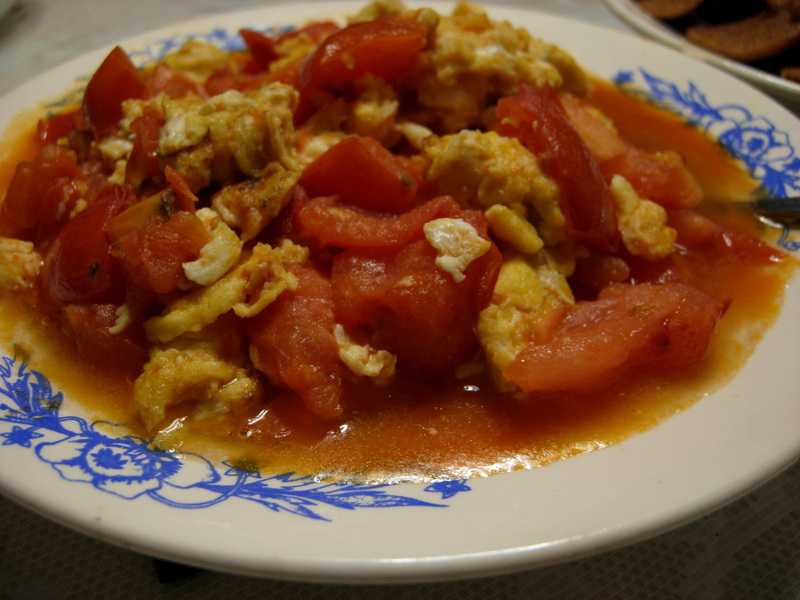 The sauce is not very thick, and complements meats and fish without the need for battering and frying. 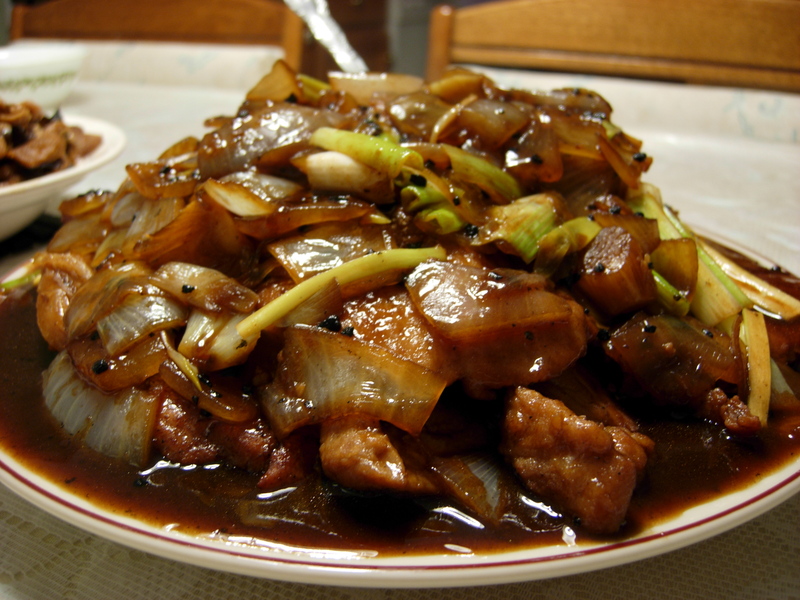 My mom made some delicious pork chops with onions in this sweet and sour sauce, topped with fresh scallions. It was mouth-watering, and the meat was succulent… mmmm. In an effort to eat healthy and use up lots of random vegetable stragglers, I decided to make this chicken vegetable casserole one night. 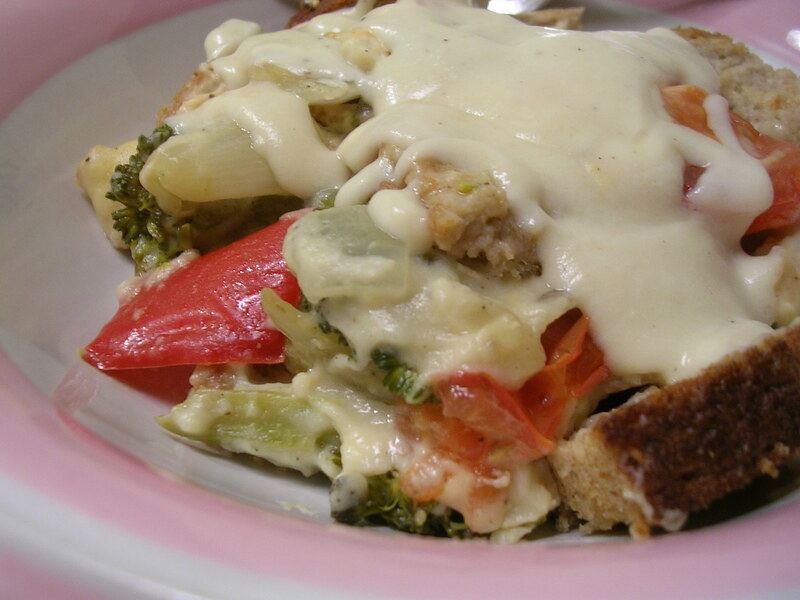 It was layered on the bottom with cubes of whole grain bread tossed in a little bit of canola oil, and then a stir fried medley of vegetables was layered on top of the bread. To maximize usage of leftover vegetables that would have been difficult to make into single dishes, I threw in 1 red pepper, 1 crown of broccoli, 1 cucumber, 1 carrot, and 1 onion. It was actually pretty exciting stirring everything together, I have never combined so many random vegetables before haha. Then I topped the veggies with a layer of chicken breast cooked in a white sauce made from a roux base (equal parts butter and flour to make a few tablespoons, mixed with 2 cups of milk) and flavored with salt, pepper, onion powder, garlic powder, and Dijon mustard. I have to say, the sauce was very flavorful and went very well with the veggies and chicken. Without the mustard it probably would have been a bit bland. Finally, the chicken was topped with a layer of sliced tomatoes, and more bread cubes were thrown on top. I omitted the cheese topping from the recipe. The casserole was baked for about half an hour, and it was served with some more white sauce on top to keep things moist. The combination of vegetables actually was very pleasant, and the proportions of vegetables to chicken was just right. A great way to use up vegetables in a one pot dish! Today my boyfriend's parents dropped by and gave us half a roasted duck from Chinatown. What a treat! We made a cabbage side dish with bacon, which was delicious because the bacon really lends a lot of flavor to the cabbage. It's funny, because we opened the fridge today to discover our broccoli and spinach and yu choy had all gotten pretty old, so the only real option was this cabbage that apparently seems to last forever haha. 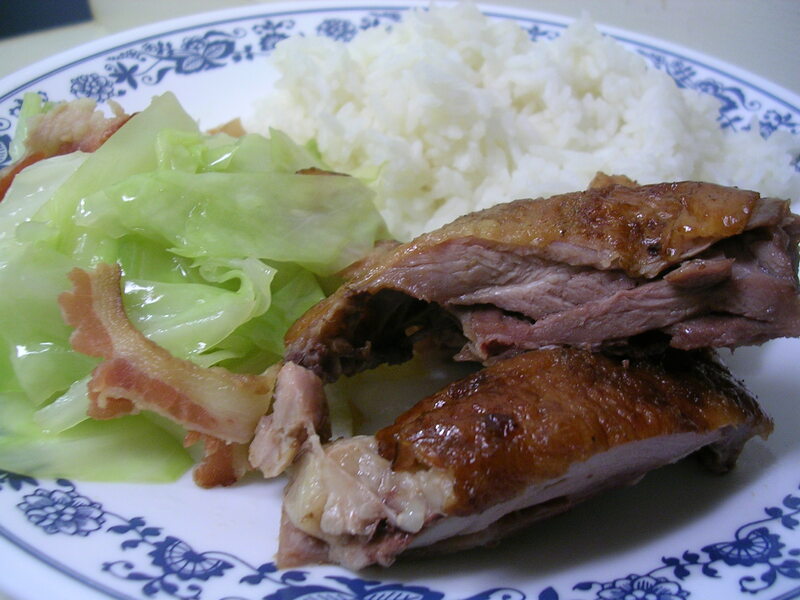 It went really well with the duck because it cut through the grease and was refreshing to eat on the side. This entry was posted on Monday, October 22nd, 2007 at 5:38 am	and posted in American, baking, Chinese, cooking, desserts, Uncategorized. You can follow any responses to this entry through the RSS 2.0 feed.